I have been wanting some boots but I wasn’t sure if they would fit my foot properly. Or if I would be able to get them on and off. I did go shopping and I was able to find some boots that zip all the way down. In addition, I found some zipper pulls that I am able to zip the zippers up with. I want to show you just kind of step by step, how I am able to get the boots on. As you can tell, I am in bed and this is where I get dressed because it is just the easiest for me. It is also where I put my shoes on. I pull my leg up – try to pull all the material up and around – and using the zipper pull, I zip it up. So that is how I am capable of getting my boots on. The next time you have a new piece of clothing or something you want to add to your wardrobe but you’re just not real sure if you are capable of putting it on, give it a shot and see what you can come up with. You never know what you can do until you try it. 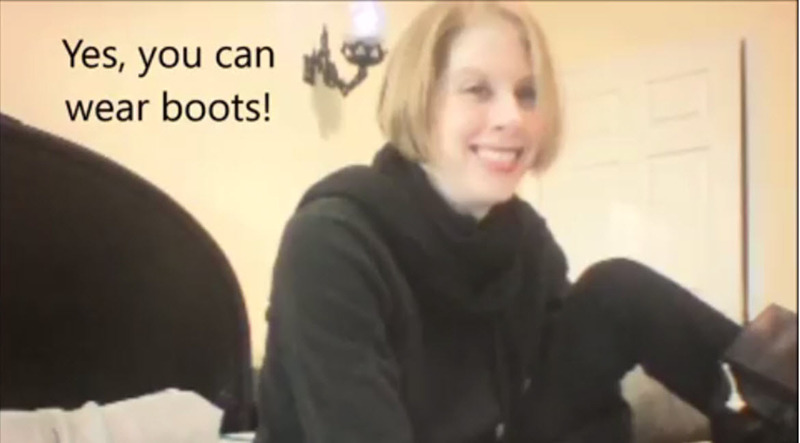 Yes, you can wear some boots! To keep you informed of new stories from Jenny, please click on the link below to 'Join Our Community'. All we need is your name and email address to keep you updated.